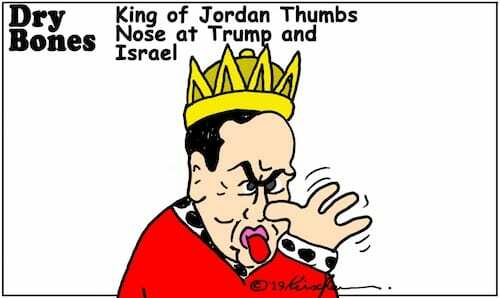 King Abdullah seems increasingly hell-bent on ending 99 years of Hashemite-dynasty rule in Jordan. Transjordan’s first Hashemite ruler – Abdullah I – arrived there in November 1920. Abdullah was en route by train from Hijaz to Syria with armed forces to assist his brother Feisal in his struggle with France to retain power in Syria. Winston Churchill – at France’s request – offered Abdullah an Emirate in Transjordan – which Abdullah gratefully accepted on 11 April 1921. These British-Franco machinations cost the Jewish people dearly – when the Mandate for Palestine – adopted unanimously by all 51 members of the League of Nations on 24 July 1922 – denied the Jewish people the right to reconstitute the Jewish National Home in any part of Transjordan (Eastern Palestine) and restricted that right to the remaining 22% (Western Palestine).